Unlike gas water heaters that have gas burners to heat the water, electric water heaters rely on a pair of upper and lower metal heating elements to heat the water. Similar to the way in which oven heating elements work, the heating elements in a water heater heat up when electrical current passes through them. Each of the heating elements are controlled by a separate thermostat. 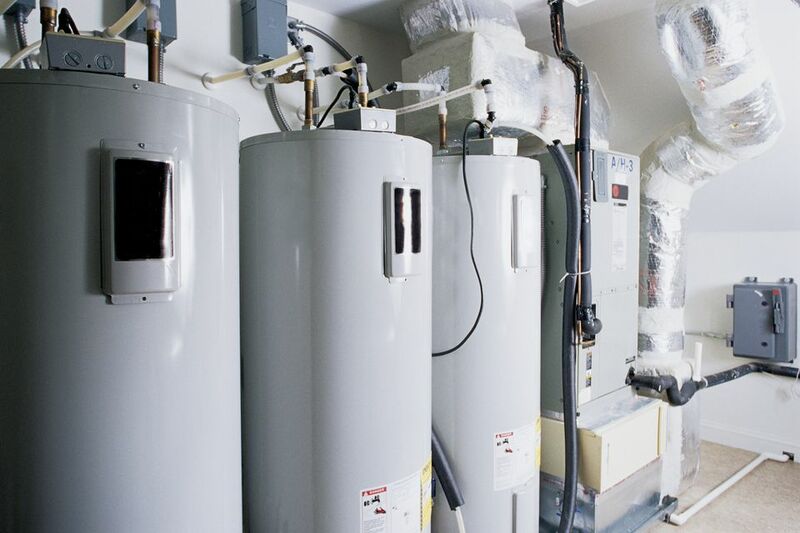 In an electric water heater, the bottom heating element is the workhorse, since it is at the bottom of the tank that cold water is delivered into. The upper heating element really only contributes when there is a high hot water demand and only serves to heat water in the upper portion of the tank. When a hot water tap is opened somewhere in the house, hot water flows up out of the top of the tank, and new cold water flows into the bottom of the tank, where the lower heating element begins to heat it. It is usually easy to tell which heating element is faulty. A constant supply of lukewarm water indicates a defective upper heating element, while a short supply of fully hot water indicates a defective lower heating element. Replacing heating elements is a relatively easy project. The new heating elements must be of the same style and voltage/wattage rating as the ones currently in the water heater. To test an electric water heater heating element, use a multimeter or multi-tester. Turn off power to the electric water heater at the main power panel by turning off the circuit breaker or fuse powering the heater. Wait for the water heater to cool. This is very important because the heating elements operate off a thermostat, and hot water in the tank will affect electrical flow to the heating elements. Open a hot water faucet and run the water until it is cool. To check the heating element for an open or closed circuit (continuity), set a multi-tester to the OHMS setting, then connect the red lead to one screw terminal and the black lead to the other screw terminal on the heating element. If the ohm reading is 0 on a digital multi-tester, or if the needle reads infinity (does not move) using an analog dial, there is no flow of electricity through the element, indicating that it is faulty and needs replacement. If you do get an ohm resistance value using the multi-tester, then the heating element itself is not bad. The problem may be with ​the other heating element or in the upper or lower heating element thermostat. Next, drain the water heater. Remove a screw-in type heating element by turning the element counterclockwise with a socket wrench and 1 1/2 inch socket. Remove the existing gasket. Remove a flange-type heating element by removing the four screws holding the element in place. Remove the existing gasket. Position the new gasket on the heating element and insert the assembly into the water heater tank. Tighten a screw-in type heating element by turning clockwise with a socket wrench until secure. Check for leaks around the heating element. Make sure the tank is full of water by running a hot water tap. This is critical because running electricity to heater elements that are not immersed in water will destroy the heating element. Turn power to the water heater back on at the main power panel by turning on the circuit breaker powering the water heater.